Myotha National Golf Club in Myanmar is something special. 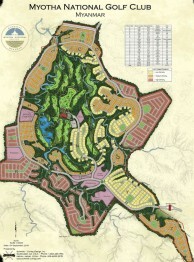 Located on a 688-hectare space, the 18 holes of golf is the best layout in Myanmar, and by a wide margin. The Myanmar golf club holds itself against the tops in SE Asia and is of such high standard that it will attract professional Asian Tour events. 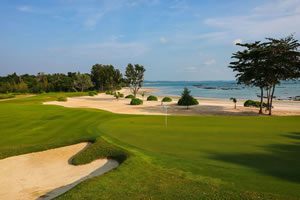 It plays a massive 8,000 yards from the tips and is one of the toughest golf courses in Asia, if not the world. At the same time, from the forward tees, the course is quite manageable and is one of those few courses that plays easier for shorter hitters. Many courses claim the same, but few pull it off. 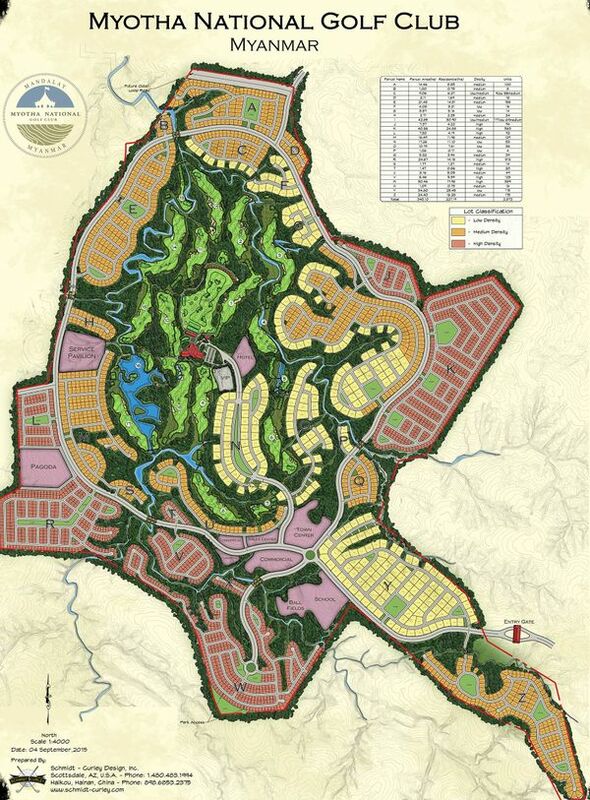 Myotha National Golf Club, which is located in an emerging industrial zone 50 kilometers south of Mandalay, Burma’s second largest city is part of a massive industrial park complex. Myotha National sprawls over a natural site of cliffs, canyons, and 40-meter elevation changes. Two very deep and dramatic arroyos wind through the course around which many holes have been sculpted. Year-round dry conditions, thick desert plant material, and scrubby exposed surface rocks make the site more resemble an Arizona desert than an Asian jungle environment. In this respect, Myotha is unique among golf courses in Asia. Wide Zoysia Zeon grass fairways and undulated and multi-tiered Champion Bermuda grass greens highlight each hole. Rugged features and deep bunker complexes create multiple ways to navigate to the green. Many of the putting surfaces are level with the fairways and have salad bowl surrounds making bump-and-run shots favored over target practice golf. Generally, quite dry conditions promote hard and fast conditions and plenty of roll-outs. Players who are accustomed to links golf will feel at home, while those who practice on park-land courses will need to learn some new shots to score well. Notable holes are debatable; they are all good. However, the 3rd is a unique S-shaped par 5. The 4th is a dogleg left, and long hitters can almost drive the green if going over the left scrubby area. Watch the second shot as it funnels into the green. Anything over the pin easily ends up the wrong tier which results in a sure 3-putt, if not worse. Under clubbed chips are preferred over aggressive shots. The 5th is one of the shorter par-3’s. Be sure to avoid the elaborate waterfall and rockwork right of the green. Walkers take advantage of a rock path to the green, while carters must park almost 360 degrees around the back to the green. Back nine standouts include the 12th which has one of the biggest tiers in the center of the green ever seen in Asia. If the pin is on the lower tier the hole is simple, go for it. However, get on the wrong tier, and a massive putt is needed to get back over the ‘wall’ in the green. A three-putt bogey is doing well. The two selfie holes are the 13th and 16th. Both par-3’s the former is in a natural canyon with the exposed rock 270-degrees around the putting surface. These rocks and the resulting canyon best characterize Myotha National. The later plays to an island green made from the all the rocks moved from other holes. Anything other than an accurate tee shot will find water. Not to let up, the closing two holes require nerves and distance to have a chance for a decent score. The par-5 17th plays to a ‘cross green’ that runs diagonally away from the fairway. The green fronted by a creek is easy to hit should the pin be on the far right. A layup and pitch here are just as good as an 80-foot putt from across the green. The final hole is as straightforward as they come at Myotha, except for the fact that it plays over 500-yards as is a par-4. To add to the challenge, the raised has a severe false front. Lay up in two, hit long on the 3rd shot and be happy with a bogey. Congratulations on finishing Myotha National! Daytime temperatures in Mandalay, except for December to February, can get as high as 40 degrees centigrade. Moreover, the distance between some holes at Myotha is quite far. While walking is feasible, golf carts are an almost must and included in the green fee price structure. Unlike most Asian courses where cart regulations mean ‘on the paths,’ Myotha’s hard surfaces and hardy grasses accommodate cart traffic so that golfers can drive right to their ball. A welcomed way to play in the heat indeed. Service, caddies, and facilities at Myotha National are first-class. F&B are always handly with the roaming beverage cart, and fine dining is specializing in Thai and Burmese dishes. 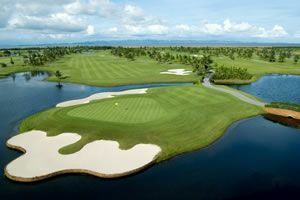 While a little far from town, it’s well worth the drive to play the best golf course in Myanmar! Have you played golf at the Myotha National Golf Club and took some nice photos that you would like to share with other golfers? Send them to us and we may upload them here. Thank you in advance!